Premier Luxury Home: 6 BR/7 BA/Hot Tub/Rec Room/Free Nights! The 'Adventure Inn' is is located in beautiful Central Oregon in Sunriver Resort. You will find this 4500 square foot vacation home a fabulous place for family reunions, weekend get-aways with friends, corporate planning away from the office, retreats, golf tournaments, conferences and multi-family vacations. If you need additional space, we also have a 7 bedroom home in Sunriver (VRBO Listing Number #76717) that can be rented at the same time. The house features beautiful stone and tile fireplaces; truly exceptional interior design and furnishings; an exceptionally well-equipped kitchen with large island/eating bar; all stainless steel appliances including two dishwashers, two ovens plus a microwave, two refrigerators, one with ice and water in the door, a 5-burner gas cook top; a custom 11.5 foot by 4.5 foot Dining Room table; an extra large, private hot tub; 65 inch high definition television in the Great Room with full surround sound; TV's with DVD players in all the bedrooms; over 160 movies; music CDs; exceptional choice of board games and puzzles; free high-speed, wireless Internet access; Xbox 360 video game system and games; Wii video game system with games; 8 bikes and helmets; as well as a pool table and ping pong. The home is stocked with lots of extra-plush linens, including extra towels for hot tub use. Our vacation home was designed with you in mind and includes all the luxuries you want to have. EVERY BEDROOM HAS ITS OWN PRIVATE BATHROOM, each with tile floors and countertops. The exceptional rear patio is spacious and comfortable. The patio also has an extra-large stainless steel barbecue and top-grade tables and chairs. The Adventure Inn is theme decorated with each area featuring a different adventure, most of which you can experience in the Sunriver area: Golf, Snow Sports, Cycling, Rafting/Kayaking, Fishing, Rock Climbing, Gaming, African Safari. There is a wide paver walkway on the side of the house that leads directly to a rear door that is only one step up into the house. This provides easy access for those that may need to avoid stairs. **Suite #1 - King Bed, 32 inch Flat Panel TV, DVD Player, Fireplace, Private Bath with two sinks, tile shower and large soaking tub. **Suite #2 - King Bed, 32 inch Flat Panel TV with DVD Player, Private Bath with two sinks and a 5 foot shower. **Suite #3 - (2) Twin-over-Queen Bunk Beds, 32 inch Flat Panel TV, DVD Player, Xbox 360 with games, Private Bath with two sinks and a 5 foot shower. **Suite #4 - King Bed, 32 inch Flat Panel TV with DVD Player, Private Bath with two sinks and a 5 foot shower. **Suite #5 - King Bed & Twin-over-Twin Bunk Bed, 32 inch Flat Panel TV with DVD Player, Private Bath with two sinks and a 5 foot shower/tub combo. **Suite #6 - King Bed, 32 inch Flat Panel TV with DVD Player, Private Bath with two sinks and a 5 foot shower. We offer free nights during select times of the year. Each offers significant savings and we hope will entice you to spend additional time at our homes while you enjoy all Sunriver has to offer. *** “3 Plus 1” Special – January thru February – Pay for 3 nights at the in-season rate and we’ll give you a 1 additional night for FREE! *** “2 Plus 2” Special – March thru mid-June and September thru mid-December (with some exceptions) – Pay for 2 nights at the in-season rate and we’ll give you 2 additional nights for FREE! This is our best pricing of anytime in the year – even if you can only stay for 3 nights. Please indicate your desire to take advantage of the specials outlined above, so that I can edit your reservation request accordingly. Lots of Activities: Sunriver is a summer paradise with over 30 miles of paved bike and walking paths, 2 public swimming pools, 2 public golf courses, boating, hiking and many other activities. Winter brings lots of beautiful snow with fabulous snow skiing available at Mt Bachelor, only 20 minutes away. And yet Spring and Fall are also great times to vacation in Sunriver with the change of seasons visible in the surrounding landscape. Antique style wall phone in garage; 3 cordless phones in house. Extra-plush towels with plenty of extras for hot tub use. Brightly lit and carpeted with pool table, ping pong, Pub Table with 2 stools, Spectator Bench, 42' Plasma TV, Overhead ceiling fan. Great reception throughout the house. Kitchen fridge has ice & water in door. Additional full-size fridge in utility room. Exceptionally well-equipped kitchen with 2 dishwashers, 2 full-size ovens, 2 sinks with disposals, 1 refrigerator with ice & water in door, 1 refrigerator (in utility room), 5-burner gas cooktop. Small appliances: toaster, 2 coffee makers, coffee grinder, blender, food processor, electric skillet, crock pot, griddle, 2 waffle makers, 2 large air pots, electric hand mixer, electric can opener, electric knife, rice cooker. Oversize, custom-made dining room table provides extraordinary room for large groups. In addition there are 4 bar stools available at the kitchen island. Over 1000 square feet of paver patio with first class furnishings: tables, umbrellas, chairs. Enclosed hot tub area is partially covered. Wide paver pathway runs from the driveway around to the back of the house where there is a single step up into the house. Extra large -- seats 7 comfortably. We decided to spend time rather than exchange gifts this year for Christmas. We may have to do this every year since we loved every minute! This home is our 3rd VRBO and by far the best! Most homes have a tired and "beat up" feel about them. Adventure Inn had a very nice high end feel. Every imaginable item was there! We really appreciated the multiple card tables for our craft projects. Three reasons I rented this house was 1: the huge table so everyone was sitting at the grown up table 2: the pool table and ping pong were away from main living area, that helped with my older parents hearing issues 3: there was a bathroom for each bedroom which helped with my crohns family member and the multiple teens we had! Other perks were the "two of everything"!!! Two ovens, two dishwashers (the best thing ever! ), Two coffee makers, two sinks, two fridges, two washers, two dryers, and more! This home is the best outfitted and well-organized home any of us have ever stayed in! Nothing is lacking....paper towels, napkins, food seasonings, etc. The kitchen and main living spaces are wonderful for groups to gather, especially the dining table that accommodated 16 with additional seating at the bar. Great home! Enjoy the friendly deer in the back! Truly a premier luxury home. Very impressived with the decorations, amenities and quality. Truly impressed with pretty much everything. Pantry with stocked with many unexpected items including spices. Every cooking utensil you could want was there, and every drawer was labeled making everything very organized. The home was configured for pretty large groups. The dinning room/great room table could accommodate all 13 of us. Kitchen was very large with plenty of counter space and storage. Two dishwashers, washing machines, and refrigerates. Highly recommended. Comfortable, spacious and well stocked! I've never rented a home that was as well stocked as this one. Literally everything was available in abundance, not just one extra roll of paper towels, or only few towels. Everything was in abundance. Loved the 2 refrigerators and 2 dishwashers. The home was very spacious and comfortable. The owner was also very easy to work with and responds very quickly. 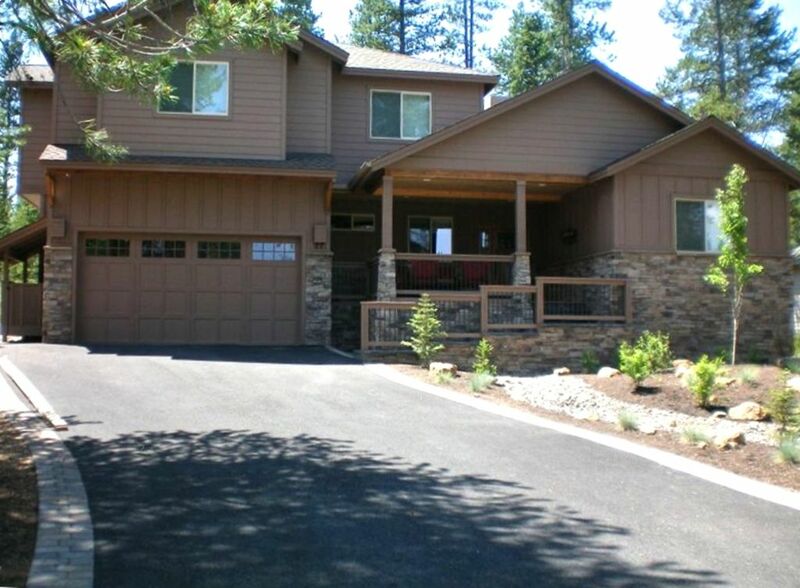 I would definitely recommend this home to anyone who is looking to stay near Sunriver resort which was extremely close by (like 7 minutes) and to ski at Mt bachelor, which is also not too far (25 min). Beautiful and fully stocked with everything you need! We really appreciated the attention to detail that the homeowners gave! The decor was beautiful, the kitchen has absolutely everything you could need for a large group! Hot tub was nice sized and private! Garage was set up so perfectly for ping pong/pool games with lots of seating options! Couch in the great room fits a lot of people comfortably, and the dining table also was great for all of us! Highly recommend this home for family gatherings! The house is amazing. It is even nicer than the pictures. The owners have done a great job supplying the house, with tremendous attention to detail. I have rented many houses on VRBO over the years and I would rate this at the very top. The owners are very easy to work with. There is really nothing for me to criticize- this home is awesome!